In his second appearance this week for POTD, Mike Danneman is an accomplished railroad photographer whose work shows up in books and Trains magazine with enough regularity that many photographers might envy him. Of course, he has a way of being in the right place at the right time! between the Big Ten curves and Tunnel 1 west of Denver on its way to Salt Lake City, Utah. As an example, he captured today's Photo of the Day in the foothills west of Denver as the three GP60s of the Rio Grande--the last locomotive units ever--hauled the Denver to Roper (Salt Lake City) manifest train up the grade toward the Moffat Tunnel on the old Denver & Salt Lake. 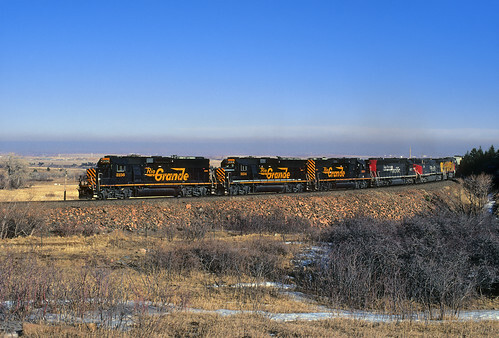 In an interesting twist, it would seem a the six locomotives formed a recapitulation of 60 years (roughly) of the Rio Grande's ownership history with itself, Southern Pacific and Union Pacific. Regrettably, all three locomotives have been repainted or renumbered, per Utah Rails, but all are still active within the last year.